Just across a dirt lot, west of Spring Mobile Ballpark, sits a bar & grill. You may not notice it if you are in a rush to a game, or on your way home from work. But once you taste the burgers, you’ll forget about going elsewhere for a game—or going to work altogether. 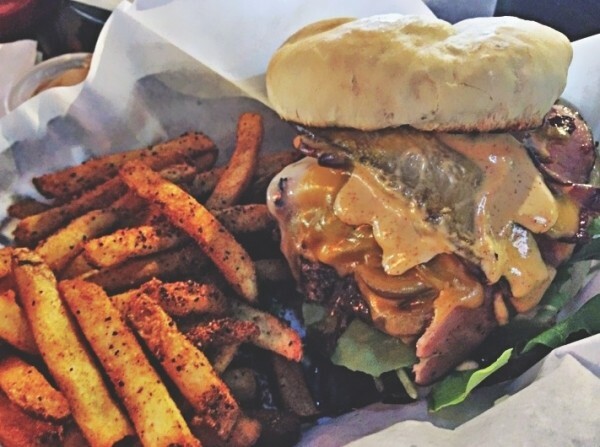 Lucky 13’s burgers include the bacon stinky cheeseburger, the fungus amongus, ring of fire, the nut butter burger (peanut butter on a burger, anyone? ), the breath enhancer and the pigpen, among many delicious others. Just for a tease, let me tell you what’s in the pigpen: house-smoked bacon (flavor-packed indeed), grilled Black Forest ham, caramelized onions, cheddar and Swiss cheeses and the tangy Lucky 13 sauce, all on a fresh, locally made bun. This is a burger so large that you’ll hardly need a side. But since this is America, bring on the french fries, side salad, beer-battered onion rings, rosemary-garlic fries, Cajun fries or fried pickles to go with your burger. The choices are so wonderful that you’ll wish you could choose to get all of them. From the first bite, the melted cheese will mix with the Lucky 13 sauce and ooze out into the basket, smothering your fries. It’s messy, but you won’t mind, as the crispy house-smoked bacon and juicy beef patty give you all the comfort you need. Halfway through the burger, you’ll realize how full you’re getting, but you’ll reach down and find the will to continue; those fries shouldn’t go to waste. If you get the Cajun fries as your side, the seasoning is one of the spicier (but also the most delicious) that I have tasted. A basket of the fries with Cajun seasoning, dipped in Lucky 13 Sauce and smothered with cheese, belongs in a museum. Now … which burger shall I have tomorrow?